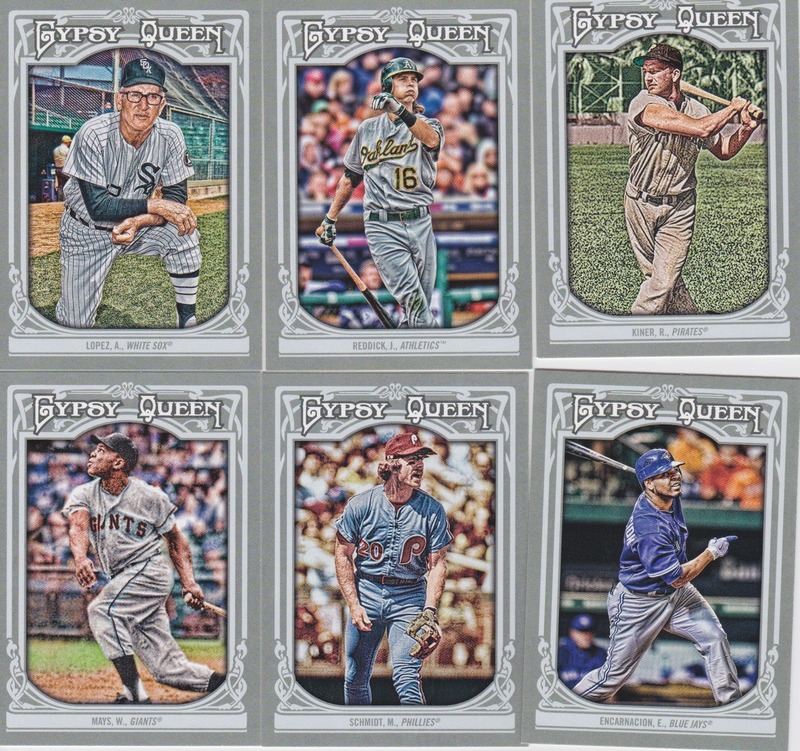 Final box of the break everyone... as I checked yesterday, about half of you should have gotten your cards in the mail so this post may be a mute point... but here we go anyways (let's hope YouTube doesn't eat my upload again like it did the last two). Love the Ripken! Headley and Hosmer look almost exactly alike in their follow through. 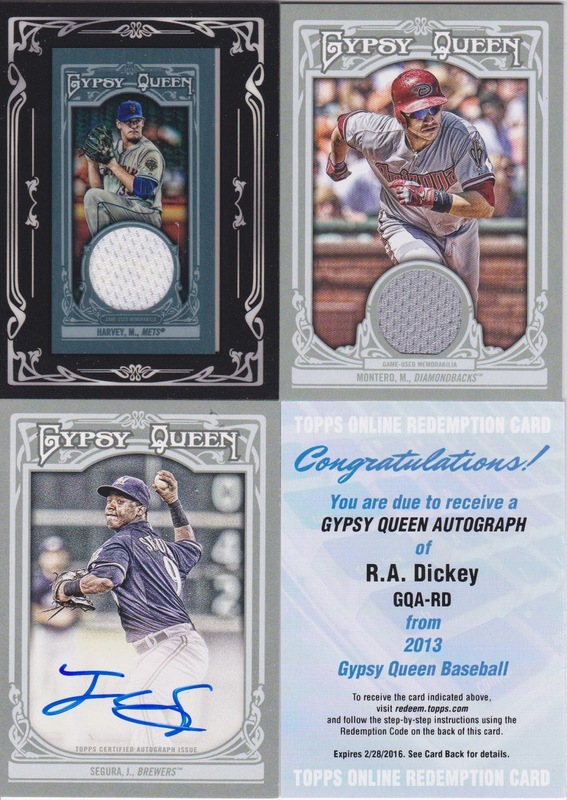 Harvey and Dickey for the Mets (every checklist I found online had Dickey as a Met on the auto, I sure hope they are right or I'll have to buy buckstorecards one of these redemptions off ebay). 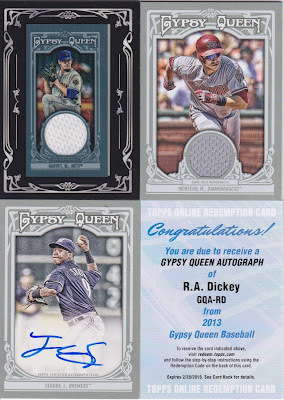 The Brewers continue their rampage through this case with another auto and the D'backs snag the full sized relic. Thanks to everyone in the break, it was a blast to bust a case of this product, even if the Astros were basically un-represented. Kind of crazy that the Yank and Dodgers both got shut out of hits. Weird. Hopefully Topps replaces the missed hit in the 2nd box and I'll get that mailed out to whomever it was supposed to go to... thanks everyone who has ever been in one of my breaks, it's been a blast bustin' wax for all of you and I greatly appreciate the trust you all have put in me with your money and cards. Great work on the break. The youtube glitches were beyond your control. If it ends up being a Dickey Jays auto, and the ebay prices are insane, I'll look for something cheaper and you can use that instead. I spent time waffling back and forth between my beloved Mets and almost as beloved Jays, so I'm really happy to see both teams come away with some nice hits. Great break Sam !!! Thanks for the memories !! Not afraid to expose Topps Weakness !!!! 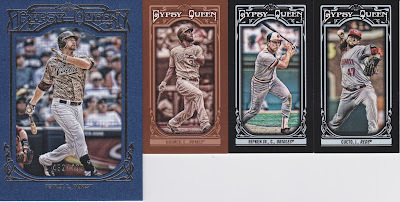 ( 40 Hits - 20 / 30 teams ) & Others !! Did Killibrew of Twins Have a SP Mini ? I got( 2) # 240 Killibrew Minis With 2 Different Pictures . Thanks Sam on a fun break !! We appreciate the work you put in !